VANCOUVER, BC – Strange Fellows Brewing has announced the return of an annual seasonal beer brewed in honour of everybody’s favourite child-stealing Christmas demon. 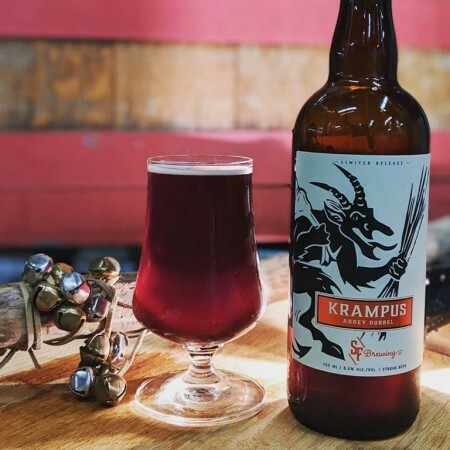 Krampus is a Belgian abbey double brewed with Belgian candy sugar and dark malts. It is rich with the flavour of dried stone fruits and subtle toffy notes. This deceptively alcoholic beer has a long warming affect on the constitution to help ignite the dark stranger inside each of us. Merry Krampusnacht! Krampus is available now in 750 ml bottles and on tap at Strange Fellows, where they will also be hosting a Photos With Krampus night on December 6th, and a Krampusmarkt featuring works by local makers and artisans on December 7th and 8th. For more details, see the links.